“Music, Culture and the Creative Spirit” is Bill Kehl’s performance that beckons us to revisit the simple and humble beginnings of primitive music and explore the discovery and deliciousness of elemental music in all its wonder. From the beginning, music has been a powerful force in creating the richness and fullness of the human experience. To this day, the magic of music touches our lives, nurtures our being, stimulates our senses and sparks our spirits with passion and joy. Diverse cultures throughout time and all over the world have continued to engage in varied creative musical expression to strike the resonant chords that celebrate our place and purpose in the cosmos. 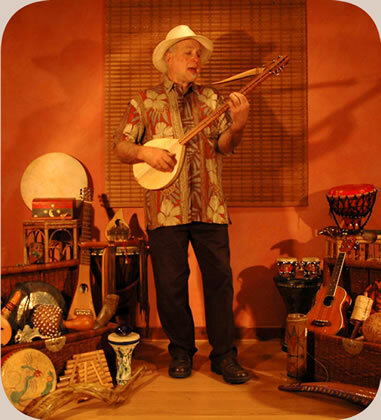 Bill has designed the “Music, Culture & the Creative Spirit” performance to educate, inspire and celebrate human creativity and ingenuity with a light-hearted, interactive performance and a multitude of fascinating primitive musical instruments and sounds. “Music, Culture and the Creative Spirit” was initially created because of such a positive response to my children’ performance, “Earth, Music… Magic!” But I felt the need to have a presentation - perhaps a bit more “serious” in nature - that was also designed for adults, yet would include some of the same thematic elements. This program provides me with a window of opportunity to delve into the subject of primitive music much deeper than I can with an audience of small children. I’ve also done my best to include many as many interactive components as possible and I have found that when provided the chance, adults are still really children at heart, too!